When searching for a birthday present for his Aunt Lucy, Paddington discovers the perfect gift - a gorgeous pop-up book of London. As it is very expensive, Paddington decides to get a job in order to raise the necessary funds. The curse of the sequel - an affliction that has blighted many a film. How often have we commented that a movie was okay but nowhere near as good as the original? Not so, Paddington 2. Director Paul King, his cast and crew have captured lightning in a bottle with the return of our favourite hat raising, marmalade munching bear. Wisely sticking close to themes that made the 2014 original such a joy and, of course, so successful - family, acceptance and seeing the best in people - Paddington 2 is a delight for all ages. The film’s heartfelt and endearing story explores Paddington’s desire to repay Aunt Lucy’s love and kindness and acknowledge the fact that she sacrificed her only chance for a dream holiday to London in order to look after a (very cute) bear in need. Paddington’s hunt for a special gift for Aunt Lucy, brings him into contact with a rather special pop-up book. Depicting scenes within London, this book performs two key roles in the movie. First, it launches Paddington on an exciting adventure and, second, it allows King to create one of the most magical animated sequences of the year. We are transported into the pages of the book in scenes that are truly stunning. Of course, the pop-up book has another important job - to introduce us to the villain of the piece - Hugh Grant’s Phoenix Buchanan. After his superb performance in Florence Foster Jenkins, might I suggest this is now a full-fledged Grant-connaissance? Grant is utterly fabulous in this movie - a perfect example of casting if ever I saw one. This performance reminds us of his impeccable comic timing and also his ability to not take himself too seriously. Meanwhile, the rest of the film’s impressive cast are also glorious. Ben Whishaw is, once again, pitch perfect as the voice of Paddington. It now feels impossible to imagine anyone else in this role (and bizarre to think that Colin Firth was their first choice). As in the original movie, Paddington is a delight to watch (it is remarkably easy to forget that this is a CG creation). He tries his paw at a number of jobs in order to earn money - each inspiring hilariously slapstick scenes. At one point, he reminded me of Charlie Chaplin’s Little Tramp - a comparison not lost on the filmmakers as a sequence mirroring one in Chaplin’s Modern Times clearly shows. It is no spoiler to mention that, at one point in the film, Paddington finds himself behind bars. Cue a series of highly comedic misunderstandings and visual gags. In addition, it is here that he meets the formidable Knuckles McGinty. Brendan Gleeson is truly wonderful in this role. As our beloved bear tumbles from one adventure to the next, so Paddington 2 practically zooms by (not a moment for little ones to get restless). The end of the film left me wanting more - this is a movie that certainly bears repeat viewings (sorry). Paddington 2 is a charming film - brilliantly funny, endlessly entertaining and, at times, really very moving. After the original movie, the bar was set dangerously high for this sequel. However, Paddington 2 has more than risen to challenge. This is a truly magical film for all the family. 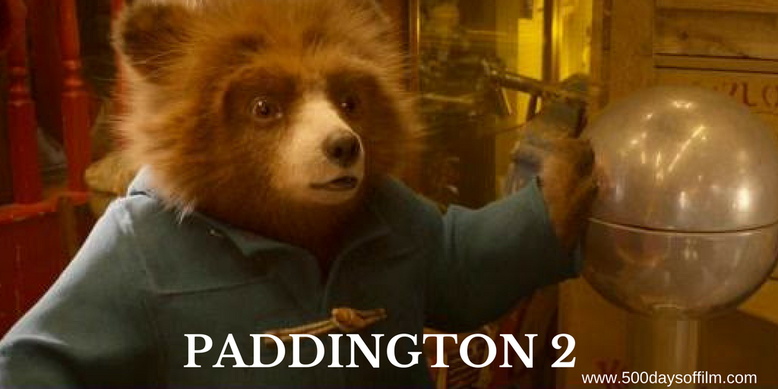 Have you seen Paddington 2?